I will also add that I DO NOT do rotations EVERY SINGLE DAY! I still find it incredibly valuable to have students participating in Math Talks, completing Performance Events, playing Games, and figuring out difficult problems with students who are not on their level. Their conversations are so important This blog post describes the majority of my time. So.. how does it work you ask? I pre-assess my students at the beginning of each unit. Make it easy on yourself and just give them a five question multiple choice sheet that covers the topics of the unit. That way you can QUICKLY assess their strengths and weaknesses. I have to use our district Common Assessments, but it accomplishes the same thing. Since the groups are flexible, I use a sticky note to record the group members’ names. I also use pencil so that I can erase. Your groups will not always be even. You may have to have two low groups for example. I hot glue the other labels to a white board. I write the materials needed and assignments students will complete at each station. I play around with a couple of different activities for Fast Facts and what you do will depend on the availability of technology in your building. If you have tech, keep reading, if not, scroll down. For those with tech I HIGHLY, HIGHLY recommend Prodigy! It is AMAZING! My kids beg me to play it and they even go home, call each other, and play online! This is a computer program that allows you to choose the standards, assign quizzes, and it grades it for you. The kids love it because it lets them create a wizard avatar and they go around a magical world battling and earning coins and pets! It’s free unless parents want to pay for their kiddos to be able to “win” more things. Some have purchased it but most have not. Before Prodigy I would have recommended www.frontrowed.com This site is AMAZING! It gives pretests for all CCSS standards and builds a program for each student! If you do not have technology, We create these Fact Folders. We create them at the beginning of the year and use them for Fast Finishers. Watch this ten second video. You can pause if you need to! 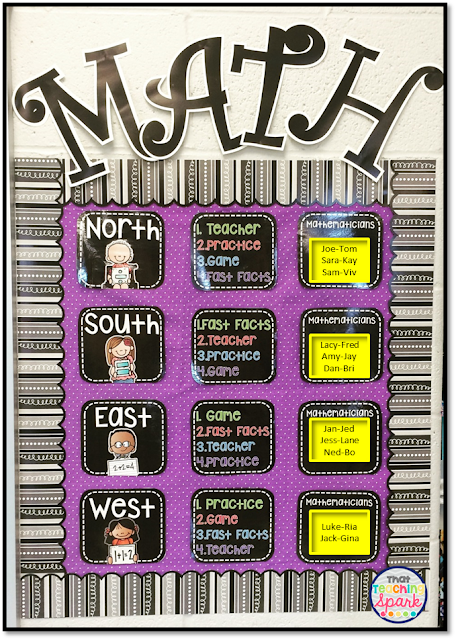 I really hope this helps give you some ideas for Math Rotations! If you want the already created board, check it out by clicking the pic below! I am very interested about your method with the rotation board because I am from Mexico an here the education is very different. We dont have differences with the students all the class is similar in the same time for all. This method give me the possibility to change my class in an easy way for my students. Thx! Only I have a question... How organize the time for each rotation? Because I dont know in EUA but here in México if I put a game the students only want to do that... Thx for your answer! The rotations are set up that they will go to each station during that day. If you look on the board it is set up by 1,2,3,4. I just stop and tell them to move to their 2nd station, etc. I so admire and respect your love and dedication for your students. As a special education teacher who pushes in her services, I hope you never lose your "spark" and continue doing what YOU think is best for ALL your students. I respect you for taking ownership of the learning of all of your students, and going that extra mile to meet the learning needs of each one of them. So many teachers expect support staff to do all the teaching to the students with the most needs, but seem to forget whose roster they are on. It is so easy to jump on the wagon of current terminology in education and forget about truly knowing your students and trusting your gut and knowledge to meet their needs, which are not always academic. We don't have to dumb down the instruction to meet their needs--this seems to be the huge misconception. Differentiation is still such an unknown practice to so many educators. Again, the love you have for teaching is so clear and contagious! I do hope that you do not become discouraged by any of the negative feedback and continue listening to your heart. Please allow your students to be your guide: the smile in their eyes when they get it, their eagerness to meet with you, their tiniest ever successes that mean the world to them. It is more people like you that we need in education! So glad you found your spark!! I started doing groups last year, and I agree with you. They are more effective when teaching math. I had one student tell me that in whole group you can just sit there and not do anything, but if you are in a group the teacher knows if you are learning. Those tricky students. I really like how you do it. Your link to TpT store isn't good, but I found you....thanks I like how you spit them up. I'm happy to have found you. Glad you find this to be successful! What font did you use for the title of the board, "MATH"? Research doesn't support ability grouping for Tier I instruction. That is what Tier III is for. Children in those "lower" groups need exposure to the thinking of "higher" kids, as well. As a principal, I don't support ability grouping in Tier I in my school. Of course all students need exposure to HOTS. But honestly, during whole-group math isn't always going to be best time to do that. If you have students who are below mastery, let alone comfort level, on the material, you an easily confuse them. Small groups, no matter the ability, no matter the material, isn't going to be a bad thing. Is it more work for the teacher? Sure. But let's not ignore closer face-to-face time with 'Tier 1'. Every child deserves to get that time with the teacher. I do the same things that are in this post! I get what you are saying about wanting them to integrate, but it isn't fair for either group really if you think about it. The higher kids aren't being challenged because they are with the lower students, and the lower ones rely on the higher to do the work for them or get confused easily. When they are being instructed at their own level, they can access curriculum, gain confidence, and do their best. Also, she doesn't do groups EVERY day....just most days. Thank you ladies! Yes, like I mentioned in the post, I don't do rotations every single day, but I do on most days. If you are in the classroom you know that not all students can be reached in the same way. 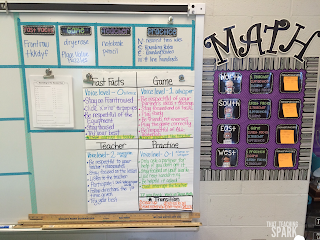 One method may work for one student and another works for a different student. Good teachers who are responsive to their students' needs are constantly differentiating in all subjects. My lower kiddos are not being talked down to and I still have high expectations for them. Like I mentioned in the post, my struggling students are still expected to meet the grade level expectation. I am not dumbing down anything, instead I am simply giving them more concrete examples that my other students are past. 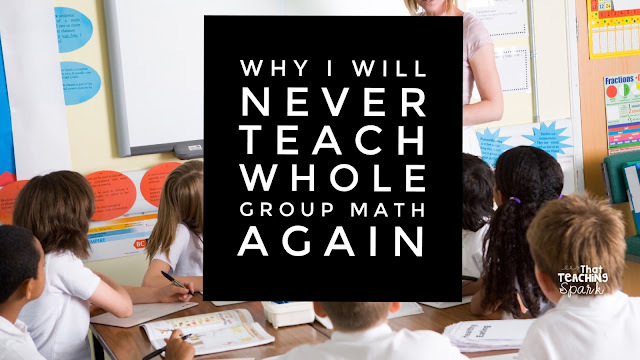 I would be so angry if my child was sitting through a whole group math lesson either bored or clueless just because my child's teacher decided whole group was best. Some days it is, but most days it is not. I am new to your site and enjoyed reading this article. I appreciate you sharing the specifics on each rotation group, including pictures, and providing an avenue for teachers to share their thoughts and innovative ideas to meet individual student needs. All students deserve personal small group time and attention. Hats off to your work! Seems like low expectations for the "low" kids. Wondering what the students and educators minds sets are? Fixed or growth mind sets. Where is the discourse and the ability to grow from shared mistakes? I mentioned in the post, I don't do rotations every single day, but I do on most days. If you are in the classroom you know that not all students can be reached in the same way. 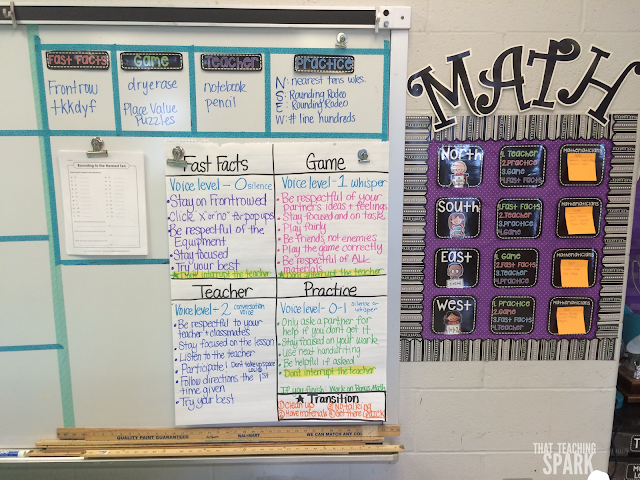 One method may work for one student and another works for a different student. Good teachers who are responsive to their students' needs are constantly differentiating in all subjects. My lower kiddos are not being talked down to and I still have high expectations for them. Like I mentioned in the post, my struggling students are still expected to meet the grade level expectation. I am not dumbing down anything, instead I am simply giving them more concrete examples that my other students are past. I would be so angry if my child was sitting through a whole group math lesson either bored or clueless just because my child's teacher decided whole group was best. Some days it is, but most days it is not. In response to the person stating it seems like low expectations for the "low" kids, I'm confused about what you don't understand. This is far from low expectations. The groups are flexible and students are pre-assessed. Therefore, what is meant by "low students" means struggling in that particular area. Meeting with them in small group is not taking away their ability to grow from shared mistakes. Chances are they all share the same mistakes and/or misconceptions and the teacher can use that to guide the discussions during the lesson. Hence, doing it this way is meeting them where they are and helping them through their struggle that is growing their brain encouraging the growth mindset. I am also very unclear about the comments of "low" expectaions for "low" students. How can ability grouping during small groups lower expectations?? I believe that this is what we call "differentiated instruction". I also run small groups that are ability grouped. BUT these groups are flex groups and change almost daily based on feedback students give me on formative assessments. Just because a student is in my "struggling" group for a particular concept, does not mean that they will always be there. He/she might excel on the next concept(s) and therefore need more of a performance based task. BUT, I will say that I do have some consistency with some students who pretty much stay in a lower ability grouping. But I drive instruction BASED on their ability. I do not dummy-down instruction for any of my students, but instead try to make them feel successful at the level that they are at. Isn't this what we are supposed to do as educators. Let's be careful as we give snap judgements to how small groups are conducted. Ability grouping DURING SMALL GROUPS... (with emphasis) allow for differentiated instruction. I am a special education teacher in a 5th grade full day integrated co-teaching classroom. About half of our class struggles with what is taught in the whole group lesson, and needs reteaching in either small group or individual instruction. We then need to move on before they are ready to due to state testing. Small groups are a great way to reach each student where they are. It seems that a balance between the two would be ideal. Maybe a whole group lesson to start the week, and a whole group share at the end of each math block would work. That way the struggling students are given the opportunity to be exposed to higher thinking and/or different ways of thinking. When teachers are meeting low students where they are, they are respecting each child's way of learning, and the pace at which they learn...this has nothing to do with a "fixed" or "growth" mindset. Not all students learn in the same way, and most students that struggle have a hard time focusing during large group instruction. Getting to know your students, respecting who they are, and finding a balance of whole group/small group/ individual instruction that works for all is key. Thank you for sharing your ideas Amy! Thank you so much!! I am so glad you understand why I believe so strongly in differientating for each learner!! Read the research from carol deck and jo boater on fixed and growth mind sets. Might change your ideas about "low" kiddos. Such an interesting term. Agreed! Carol Dweck, and a book specifically applying her research to math, "Mathematical Mindsets"
Your ideas for rotations are really helpful, but I will still start with an whole class explicit instruction, then use the teacher time to reinforce or extend concepts as the need arises. My team and I have been trying to figure out how to make small math groups work for our math instruction given the block of time we have. We've noticed the exact same things with our learners during whole group and would love to provide more differentiation. Would you mind answering a couple of questions for me? 1) How long is your total math block? 2) If you don't do any whole group intro to the concept, how are your middle of the road kids able to complete a game if they haven't received any instruction on that concept? 3) How long is your transition time between each rotation? Seriously. The term "low" is never shared with students. We don't say "okay, low kids meet me at the table". This is about kids who need help in the same area. We call them low because they need more assistance than others in order to understand the idea/standard/topic being taught...and not always, as these groups are flexible. I think most teachers understand that. How long did it take you to set this up for classroom management? I have slowly tried to implement a version of this, but the groups that are not with me tend to be very off task. Can you share your insight? I would love tips for this as well! The level of math talk has been awesome in my class this year. I agree that you need to mix it up and do some smaller group teaching. When a child is one of twenty-six it is very easy to slip into the background and not learn. I have several that do not cause disruptions during lessons, but certainly do not participate. When it is time to practice the skill we just went over they are clueless because they have not learned. Many times I have heard, "The one doing the talking is doing the learning." If you are working with smaller groups they have no choice but to participate. This is a great post! thank you for sharing! I am curious if you could tell me where I can find out more information about your Math Fact Fluency Cards. Thank you! About how much time do you do this in? I'm so interested in doing something like this, but it seems like a TON of work to come up with different stations every day (or most days), and then to differentiate the lesson on top of that -- like the inquiry based learning projects. Is it really time consuming or does it just seem that way? Wonderful post!! This was my first year doing formal Math Workshop and I won't go back to doing whole groups lessons more often than small group. You are right about the one-on-one face time with the kids! If gotta say this though -- We did use Prodigy and XtraMath until I came across MobyMax (http://www.mobymax.com). Holy cow -- GAME CHANGER! Prodigy always glitched for my kids and they would get frustrated. I feel that MobyMax *far* exceeds Prodigy and XtraMath in that it's a one-stop shop for all subjects (including fact fluency) and is super fun for the kids. It gives an initial math assessment (and I had them take another for the end of the year), then differentiates the work based on how they do. It fills in only the standards they are missing and is more constructive in their learning as compared to the other tools. I use it during my "Tech Time" station. It also has a HUGE variety of other subjects, all tied to Common Core. Our private school doesn't necessarily use Common Core standards, but at least my kids are getting the basics if they leave our school. I HIGHLY recommend everyone check it out! How long do the groups spend at each station? You have described almost exactly what I do in my 3rd grade classroom! Seriously! From your rotations, to the order, to the programs used (Xtra Math)...I love it and it works great for me! Do you plan 40 minutes for your math lessons? You said that you can be flexible with the time, but generally how much time does it take to get through an entire rotation? Hi! I'm curious as to what materials/activities you use for your West group. I struggle to find "in depth" material that is truly challenging for these types of learners. Thanks! Do you sell your black (North, South, East, West) and Rotation cards at all? I've been very eager to get this started in my classroom. My question is what if you have students who do not complete their practice work? I have some students who may work slower than others, and I didn't know if you had any insight on that? She is an amazing resource for math. Use the sidebar of the site to get the materials for your grade. I highly recommend the "Building Fluency Through Games" section! Enjoy! Are the students with the teacher longer than 10 minutes? I saw that each station is 10 minutes, but didn't know if the teacher station is longer. Thanks so much! Good evening! I am very intrigued by your post and have put your document in my shopping cart. But, I was wondering if you had any thoughts on using these rotations with a split class. I have 16 grade 3/4's (11 grade 3's and 5 grade 4's) At times they are learning the same things but not all the time. Any ideas on how to work the groups? I am located in Quebec, Canada therefore, my curriculum is different but still very similar. Thank you for the help!